I enjoy pushing the envelope of reality and using metaphors to describe new worlds, concepts, and ideas. 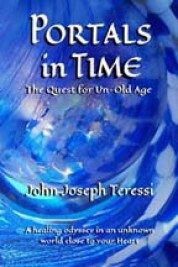 Portals in Time: The Quest for Un-Old-Age" is a fantasy novel that uses time travel and exciting adventures to share philosophical and metaphysical lessons that will enhance your life and live in your heart. "Life is always about the Now and not the Then of When. Power is ONLY available at each moment and all those extended moments,..."